I Want to Hold Your Hand composed by John Lennon and Paul McCartney. Arranged by Johnnie Vinson. For Concert Band (Score & Parts). Score and full set of parts.. 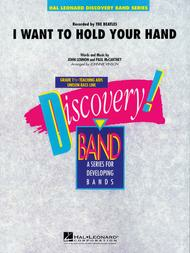 Discovery Concert Band. Grade 1-1/2. Published by Hal Leonard (HL.8725026).The music of the Beatles never grows old. Here is a very easy version of one of their early hits, expertly scored by Johnnie Vinson. This one will go together easily and sound great.